Paint Out™ is an art event aiming to refresh and redefine 21st century en plein air art practice. 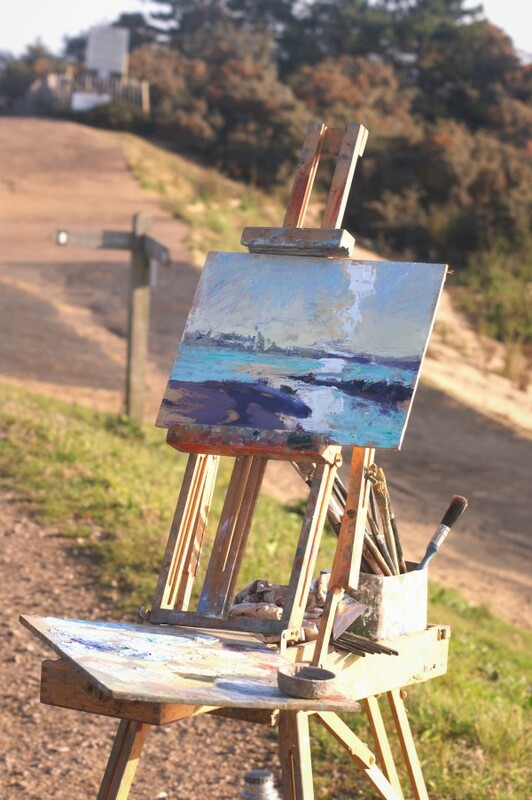 Founded in 2014, we are the UK’s premier and only fully juried en plein air art competition, celebrating the talents of national and international artists before a wide and growing audience in the heart of medieval and iconic Norwich, as well as around beautiful Norfolk including Holt, Great Yarmouth, and Wells-next-the-Sea. Many of our events are about extreme painting challenges, in any weather, up against the clock and the gaze of the art-loving public. Come and Experience Art, Live! 2019’s outdoor painting programme brings us to Cambridge with Cheffins Fine Art for the first time (13-15 May), a collaboration with the Holt Festival (19 July), The Sainsbury Centre for Visual Arts (SCVA) 2-4 July, and with the Norwich Hostry Festival (15 Oct). Through a series of one-day Paint Outs we will also explore Norfolk’s historic and hidden gardens including: Stody Lodge gardens (26 May), Elsing Hall gardens (16 June), Houghton Hall walled garden (14 Sep), Hunworth Hall garden (5 Oct), Norwich Plantation garden (15 Oct). Register for any and all of these events to be contacted when entry forms and pricing are live. Read more about our 2019 events launch. 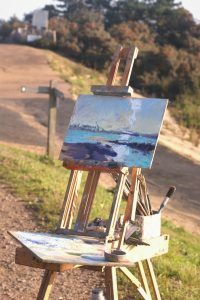 Plein Air – Art works carried out in the open air – chiefly painting. The Paint Out competitions and invitationals accept any 2-dimensional media or mixed-media applied to a canvas/board/paper embracing drawing, pastels, oils, watercolour, gouache, acrylic, pen and ink, screen-printing, and even digital in certain categories. Innovation and originality are encouraged alongside traditional art forms. We are increasingly moving towards displaying mostly unframed ‘art in the raw’, showing off plein air art in a fresh way, hot – or rather wet off the easel. We seek to capture the urban city and country environments in contemporary ways for a new and modern audience as well as established art collectors. We bring art and artists to the people, rather than vice versa, with our artists on the streets and pop-up galleries on the greens. If you want to commission or collaborate with us to bring an event to your location, please get in touch. We have a number of events in East Anglia before the annual premier event Paint Out Norwich to whet your appetite including several one-day PaintOuts in Norfolk historic and hidden gardens from May-early October including opportunities to paint historical changing rural and urban landscapes in Cambridge, Holt and Norfolk as we seek to use Paint Out events to document our changing environment. 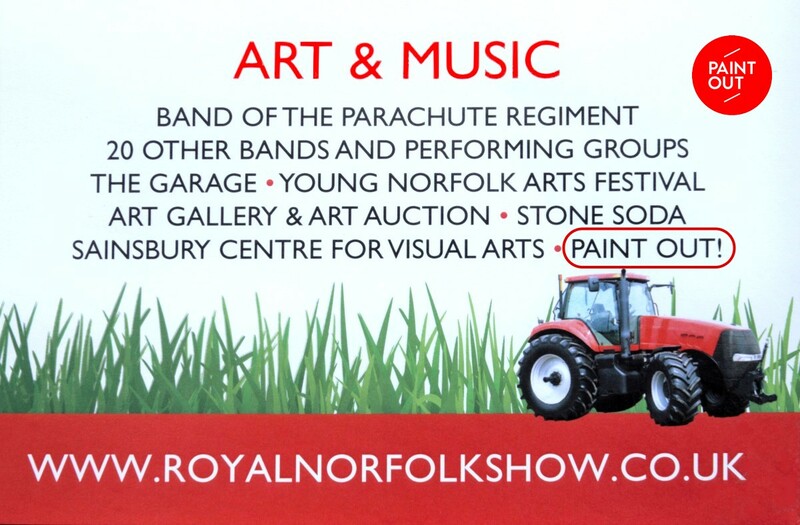 2017 saw Paint Out go to the Royal Norfolk Show, and in 2018 we had events in Sudbury, Suffolk and Great Yarmouth, Norfolk. We aim to grow Paint Out year-on-year in terms of the variety, challenge, location, and quality of events. Paint Out Norwich 2018 competition, categories, prizes, event dates, and locations, for the plein air painting days during the Hostry Festival 2018 ran 13-17 October with 2-5 days of day and night (optional) painting, artist workshops, a public ‘paintout‘ (21 Oct), and a private view, awards and art sale. This was followed by an art exhibition of over 150 paintings until 28 October at the Norwich Cathedral Hostry each day. Over 50 applications were juried by our selector David Curtis ROI RSMA, and some 35 artists participated this year. Locations for painting included the bustling market – one of the oldest and certainly the largest in the UK, serene medieval Cathedral quarter including film-featured cobbled Elm Hill, the soon-to-change 1960s urban landscape of Anglia Square, its intact Norman Castle (and art gallery housing the Norwich School of Painters collection, paintings are also held by the TATE, Colman family and Mandell’s Gallery, the proprietor of which is one of the judges this year), and Norwich Lanes by night. There was also the opportunity to paint the historic Colman’s factory site before Unilever close operations there, the SCVA grounds, and Whitlingham Country Park. The 2017 & 2016 galleries are viewable online, as are other past events. A new one-day event – Paint Out Great Yarmouth on 1 September, from Seaside to Quayside, in collaboration with Norfolk Museums Service and particularly the Time and Tide Museum’s event ‘Drawn to the Coast: Turner, Constable, Cotman‘ which explores the identity of Great Yarmouth and its surrounding landscape through the artwork it has inspired. The Paint Out Wells 2018 competition on the North Norfolk coast offers either a weekend-only pop-up event (2015-2017) or a one-day intensive paint day on the coast (2018) making it more accessible for those with jobs and other commitments. The event runs early September and in 2018 it was 8 September. Artist Will Topley at Paint Out Wells 2016 by Giacomo Gex on Vimeo. Paint Out provides an excellent opportunity for aspiring and seasoned artists to acquire and refresh core skills. 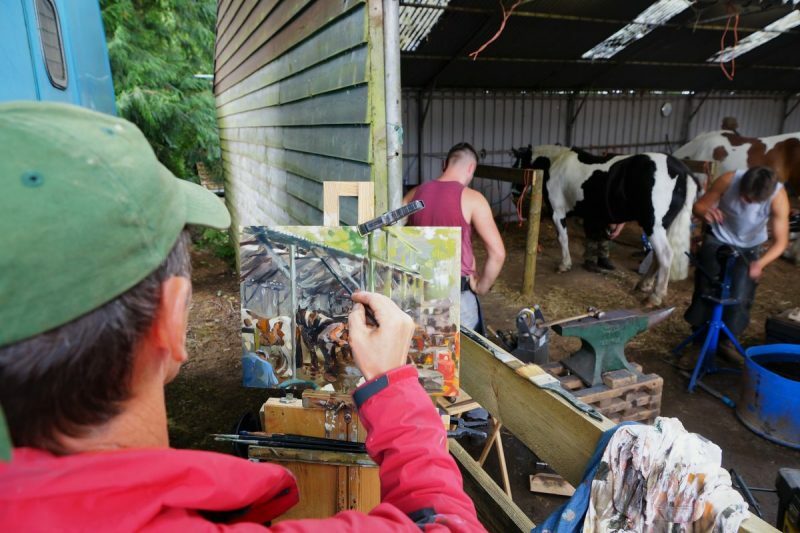 Themes include painting and drawing, colour theory, composition, perspective, and best en plein air practice in oils, watercolour and other media, both as practical workshops and as public paint outs. 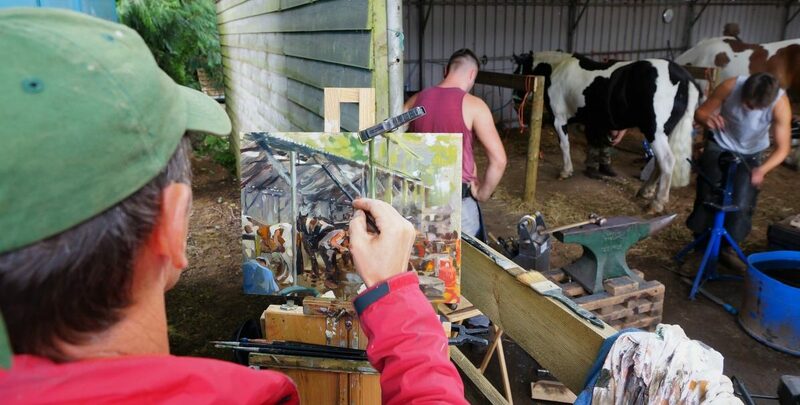 Our education programme is taught by experienced professionals and covers everything you need to take your art to the next level, with a particular emphasis on Plein Air essentials. In addition, we have entrepreneurial advice about growing your art business alongside your art practice covering blogging, social media, photography, framing, pitching to galleries, and selling. Finally, we put things in context with cultural and historical talks and tours. Join our mailing list or register interest in our events to stay informed. 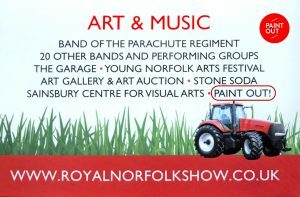 Paint Out 2017 featured a select group of invited artists painting the UK’s largest two-day agricultural fair – the Royal Norfolk Show. With up to 100,000 visitors it is the premier event of its kind. Our artists and team were to be found around the Show and at the Leathes Prior sponsored Paint Out tent. There was an auction of the still-wet fresh art on the Wednesday 28th by Arnolds Keys fine art auctioneers and a rolling gallery exhibition and sale of paintings from shortly after 8am 28 June to 6pm 29 June. Archant sponsored and presented £500 of prizes for First and Second places “Best in Show” paintings to Robert Nelmes and Tom Cringle. Norwich Art Supplies provided the art materials voucher prizes, presented to Haidee-Jo Summers and Mo Teeuw, for the jointly-shared Spirit of Plein Air award. View the Gallery of art painted and those still for sale. You can read our latest blog posts, news and updates here. You can also contact us by Email and follow us on Facebook, Google+, Instagram, LinkedIn, Pinterest, Twitter, and YouTube to keep up to date with local art exhibitions, progress of the 2016 competition, and news about our artists.